Shearwater will acquire 4 new Ocean Bottom Seismic surveys for Aker BP and Equinor. Shearwater GeoServices is awarded 4 new Ocean Bottom Seismic (OBS) surveys by Aker BP and Equinor for 2019. Aker BP has awarded Shearwater with a multi-year OBS contract. The first three surveys will be over at the Frosk discovery, the Ivar Aasen field and the Valhall field. For Equinor, Shearwater will acquire a survey over the Gullfaks field. The projects will be executed by two of Shearwater’s multi-purpose vessels, WG Tasman and WG Cook using the proprietary Q-seabed OBS technology. 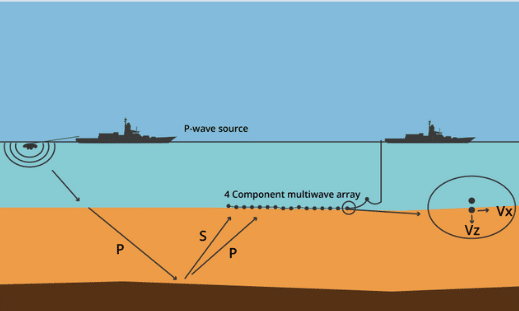 OBS means placing stationary receivers on the seafloor in cables or nodes with a separate vessel for source. Shearwater’s Q-seabed system is a cabled multicomponent ocean-bottom seismic system. It is a single-sensor acquisition system with fully calibrated hydrophones and three-component (3C) accelerometers. Data can be recorded from up to four cables, each with a maximum active length of 30km, and can operate in water depths up to 1500m. Shearwater GeoServices is a global provider of marine geophysical services, which owns and operates a fleet of 14 fully equipped seismic vessels offering a full range of acquisition services including 3D, 4D and OBS. In November it bought the marine seismic acquisition assets and operations of WesternGeco, the geophysical services product line of Schlumberger (“Operating 14 vessels”).